The Catholic church is represented in Bollington by St Gregory’s church in Wellington Road, St Gregory’s primary school in Albert Road, and the Salesian mission at Ingersley Hall which the church refers to as Savio House. The church was established here by Father John Hall, from Macclesfield, in 1830. This was a time when the local Catholic population was expanding rapidly as a result of the influx of Irish families to work both in the mills and on the construction of the Macclesfield Canal. The first church, or rather, chapel, was two rented cottages which served both as church and school. In 1834 William Turner of Shrigley Hall gave land to both the Anglicans and the Catholics for the construction of new churches. While the Anglicans built St John’s in Church Street the Catholic St Gregory’s chapel was constructed off the end of nearby Chapel Street. 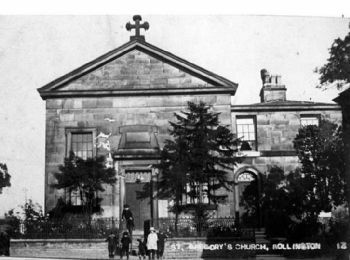 Fr Hall continued to minister to Bollington from Macclesfield until the first resident priest came in 1845. 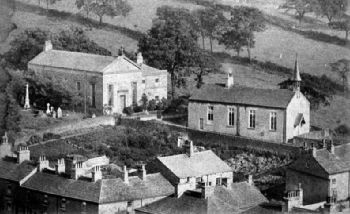 In 1866 the church converted a row of cottages in Chapel Street to become their first school in Bollington. In 1952 Fr Thomas Osbyrne came to the town. He was described as ‘perhaps the most dynamic of all Bollington’s parish priests‘. In 1957 he demolished the original buildings and built the present church and presbytery in Wellington Road. The cemetery remained in Chapel Street. In 1962 he built the new school in Albert Road and converted the Chapel Street premises back to cottages. He erected an ex-army hut behind the church to serve as a church hall. In 1981 the Salesians became responsible for the parish. At about this time the Salesians vacated Shrigley Hall, which then became an hotel, and took Ingersley Hall (Savio House) where they remain to this day.